The number of authors per article in the subject area Immunology and Microbiology is 9.7 on average with a maximum of 83 authors. The mean number of coauthors is increasing by 0.4 per year in the respective time period (Figure 1). The articles in this analysis (n = 968) were cited 34.4 times on average with a maximum of 2938 citations which is the second highest value across the 27 subject areas according to our methodology (see below). 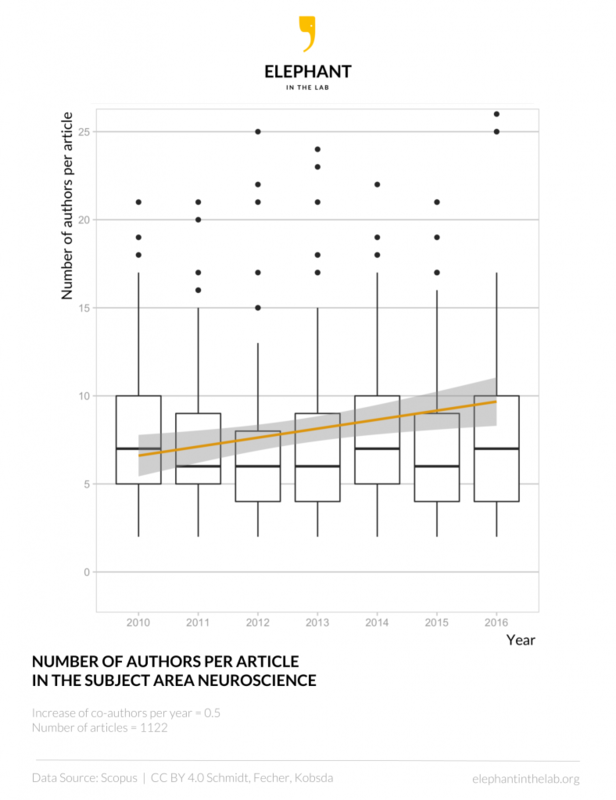 The number of authors per article in the subject area Neuroscience is 8 on average with a maximum of 342 authors (Figure 2). 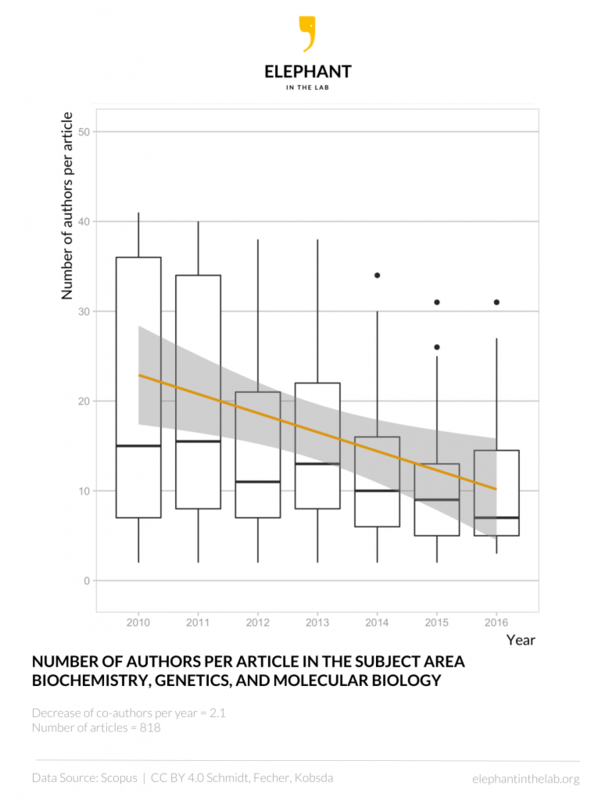 The mean number of coauthors is increasing by 0.5 per year in the respective time period, which is the second highest value across the 27 subject areas. The articles in this analysis (n = 1122) were cited 38.8 times on average and 924 as maximum. 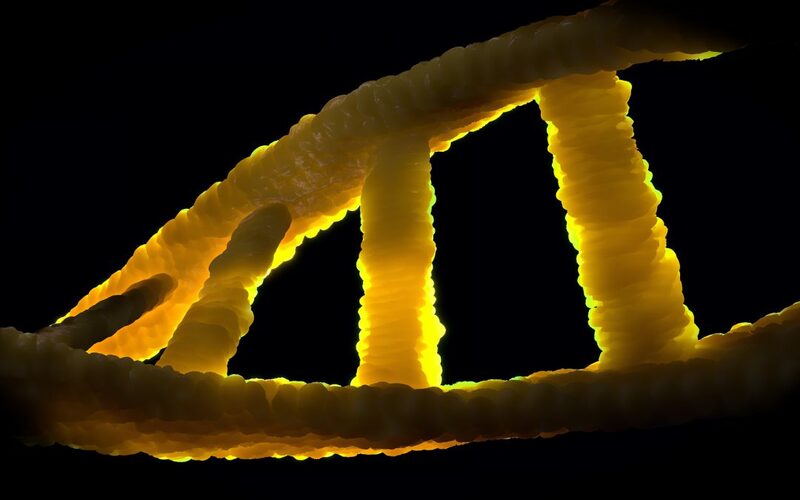 The number of authors per article in the subject area Biochemistry, Genetics, and Molecular Biology is 16.7 on average with a maximum of 1269 authors, which are the second highest numbers across all subject areas. The mean number of coauthors is decreasing by 2.1 per year in the respective time period (Figure 3). The articles in this analysis (n = 818) were cited 33.4 times on average with a maximum of 1774 citations. 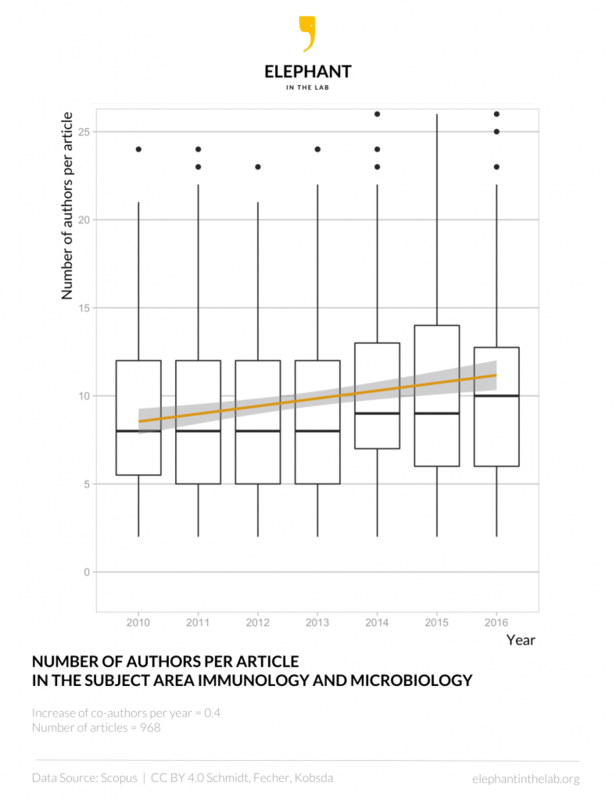 Figure 1: Boxplot of the number of authors per paper in the subject area Immunology and Microbiology. The box denotes 25–75% of the values with the median (bold line) in it. The small circles are outliers. Due to a limitation of the y-axis, some outliers are not shown. The yellow line shows a linear model of the mean number of authors per article with a confidence interval of 0.95 shown in light grey. Data source: Scopus. CC BY 4.0 Schmidt, Fecher, Kobsda. Figure 2: Boxplot of the number of authors per paper in the subject area Neuroscience. The box denotes 25–75% of the values with the median (bold line) in it. The small circles are outliers. Due to a limitation of the y-axis, some outliers are not shown. The yellow line shows a linear model of the mean number of authors per article with a confidence interval of 0.95 shown in light grey. Data source: Scopus. CC BY 4.0 Schmidt, Fecher, Kobsda. Figure 3: Boxplot of the number of authors per paper in the subject area Biochemistry, Genetics, and Molecular Biology. The box denotes 25–75% of the values with the median (bold line) in it. The small circles are outliers. Due to a limitation of the y-axis, some outliers are not shown. The yellow line shows a linear model of the mean number of authors per article with a confidence interval of 0.95 shown in light grey. Data source: Scopus. CC BY 4.0 Schmidt, Fecher, Kobsda.